Are you open to receiving more in your life? Supposedly the Universe around us is abundant, all we need do is open ourselves to receive from that abundance. The key is being open. Open to receiving. 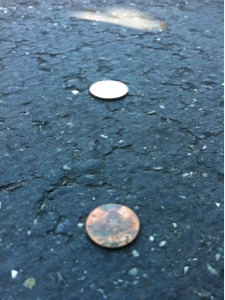 Maybe you are walking through a parking lot and see a penny lying on the pavement. It might be old and tarnished but it is a penny. What do you do? Do you snub your nose at this bit of free money? Or do you bend over, pick it up, and thank the universe for bringing abundance your way? That very thing just happened to me. An old corroded penny, lying on the pavement. At first I passed it by, but then thought to pick it up and acknowledge the universe for bringing me this gift. Soon as I straightened up, I saw a quarter lying on the ground a little ways away. It was as if the universe were showing me, open the door to a little bit of abundance, and more abundance will follow. What spiritual diseases do we carry and pass between us? 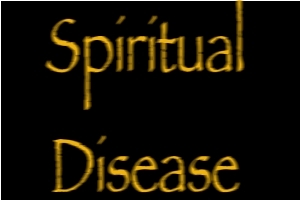 Is there such a thing as "spiritual disease" that can be passed from one person to another? It would be like Germ Theory that says one person coughing on another is enough to pass a cold or flu or whatever between people. While one could cook up a theory of subtle energy virus's, I've just read an interesting article on The Huffington Post that has a different take on the phrase "spiritual disease." Rather than talk about infections of the subtle energy system, the author speaks of different forms of imbalanced spiritual practice, or imbalanced use of spiritual ideology. Can spiritual transformation be as quick and easy as popping into a fast food joint for a burger and fries? Is dressing the part of a spiritual person enough to be spiritual? What is the real motivation for spiritual exploration? Does our ego create our spiritual experience? Does fill-in-the-blank spiritual teacher have a real state of enlightenment? Does being spiritual make one superior to others? What about the tendency for groupthink among spiritual seekers? Can one group of people truly be Chosen By God to be more special than another? Is this the God that loves all creatures equally? Is there a destination or end-goal in the process of spiritual exploration or enlightenment? It's worth a look-see and reflect on any way these imbalances are present in ones own life. When do you practice healing? Only while giving a healing session to a client? What if "healing" is practiced as a way of life? What if "healing" can be practiced even by those who do not have official training as a healer? In healing training we are taught how to use a body of healing techniques for a client, to help the client with their healing process. One could come away from healing training believing two things: 1) that only trained healers can give healing sessions, 2) that healing is only performed in a healing room during a healing session where the healer is using the techniques they trained to learn. What if both of those thoughts are false? I'm taking a trip and while hanging out in the airport some people started congregating near me, one frightened with panicky breathing. It turned out to be a 17 year old young man traveling with his family. The airport police was there, and medics were on the way. The question was, what would be my choice in this situation. I could have gone somewhere else, essentially running away from this fellow human being who was in need. I could have sat there doing my best to ignore the situation, and go about reading e-mail. I could have used some healing technique on the sly, unasked for, risking some kind of karma crisis. What I did was to pray, calling for divine presence, praying for health. Holding divine space for a scene like this takes a long time. The person in crisis must allow himself to feel the divine space and shift out of the crisis mode. There may also have been something else such as a food allergy or mental illness that I am not aware of. In any case the scene unfolded over twenty minutes or more. Me, on the side of the scene, breathing deeply, praying for the divine presence, for health, staying centered as much for myself and the others involved in the scene, as it was for the young man. As the medics worked with him, coaching him into deep calming breaths, I noticed how the medics worked not only with the young man, but his family members. For, this scene was not just the kid, but his brother, his sister, his mother, and his father. As the scene worked its way towards a conclusion it occurred to me, what if we healers lived this way in regular life? Do we hold this sort of divine space only in our healing room? Why not also hold divine space as we go about our lives? While waiting in line at the post office, rather than let the slow service turn you into a raving lunatic, what about holding divine space? This could be a continual practice throughout the day. Of course nobody expects to be the perfect healer every moment of the day. But the spiritual practice we develop as a healer can be a routine part of every day. There is a question to ponder about the karmic implications. My understanding at this time is that holding divine space is not the sort of relationship we have with regular clients. In a healing session we get into a relationship with the client a part of which is that the client must explicitly ask for healing. On the other hand as we go through life and see someone (or ourself) in need of divine assistance, it is not always possible to get them to ask for our healing assistance. Divine space, however, is divine space. The prayer can be as simple as "come holy spirit, bring health!". The arrangement of the relationships in that space is clean, in that your involvement is solely holding the intention of divine holy presence. Divine holy presence is available at all times in every molecule of the universe, meaning that we are simply accentuating something that is already present. We need money to live in the modern world, to pay for food, rent/mortgage, travel, clothing, entertainment, etc. It is easy for the subconscious to identify the need for money as a core piece of our identity. Rich people are often given higher social ranking, while poor people often are lower in the ranks, and this segregation of people by how much money they have dismisses the individual value of the particular person. Is the rich person truly better quality person than the poor person? The answer is actually quite complex because examples and counter examples are all over the map on these distinctions. But this and other issues can drive the subconscious of an individual to seek money as the source of stability and self worth. This may turn into seeking to buy brand name whatevers of prominent brand names, because wearing Gucci shoes (for example) makes ones wealth more obvious. But buying the prominent brand names means you spend more to buy your things, than if you simply bought the inexpensive generically branded items. The question is whether that prominently branded item has a real qualitative advantage over the inexpensive generically branded item. The more money you spend requires you spending more of your life energy earning that money. Quality, well built, useful items, makes better use of your money than if you seek out the cheapest flimsiest item to save a few dollars. That is, what's the proper balance about owning stuff that makes sense to you, the time you spend to earn that money, and efficiently using the money you gather with the time you spend earning money. Are you pondering a life changing decision? To move somewhere, change career, etc? Maybe you have already made your decision but have changed nothing as yet. For example maybe you're still in your soul crushing job "waiting for the right time" to make your move and change things around. Let me ask, if you've made your decision but not acted on that decision, have you really decided? Once you act on a decision all the effects of that decision come clear. It is when you act that you commit your self and your life to the consequences of your action. By acting on a decision you have committed yourself to that decision. Until you do act on the decision it's always possible to take a different course than the one you supposedly decided upon. An unfinished decision is like a weight hanging over you. The decision ("do I or don't I") nags in your mind, causing your mind to weigh between different alternatives. Indecision saps at your strength because of this. A decision you haven't acted upon is also a weight hanging over you. Supposedly your decision has become "when will I do _____" but because you haven't acted upon the decision it's always possible, as we just said, to reverse your decision and take a different route. Hence you now have two decisions hanging over you: "when will I", and "will I actually do it". Perhaps it's better once you've made a decision to, well, "Just Do It". Are you a "lighthouse of peace"? Are you engaging the power of your heart? There's a lot of crazy things going on right now and it's easy to get lost in the turmoil and worries about which direction our world is going. Below I've pasted in a video expressing some spiritual teachings of the sort I've found useful in dealing with inner and outer turmoil. I'm sharing this hoping to remind a few people to seek ways to feel peace in these turbulent times, and to respond to the turbulent times with the power of centered decision making so that our society overall will make better decisions in these times. The key meme they're presenting is "Wisdom Guiding Power" but I think they chose a weak way to demonstrate this concept. This concept of "wisdom guiding power" is what makes the difference between destruction and the construction of beauty. Our society has created many powerful tools but tools don't have wisdom of themselves. You can use a hammer to bash things apart or you can use it to build a beautiful house. In the video below they talk about a factoid that the Heart has the strongest electromagnetic field in the body. The Heart's electromagnetic field is way more powerful than the brain's. And therefore why do we focus on the brain and not the heart? That's a great point.. put another way our society focuses on mental decisions, mentality, and the product of mental activity. A lot of wonderful things have been created that way, for sure. But something has been lost in our embrace of rational logic, and that's the emotional self. No matter how rational we become we have emotions and we have hopes, dreams, aspirations, as well as high spiritual potential. There is so much more to us than the mental field, but our society is only valuing output from the mental portion of our selves. This is a deep split in our society. One way of interpreting the video below is a call to healing that split. However the argument in the video is flawed. To understand why I want to show three analogies. Electric motor driven equipment (drills and hand tools, electric vehicles, kitchen appliances, etc): Electric motors use electromagnetic fields to convert electricity to mechanical power. Trust me, there is zero wisdom in an electric motor, instead there's wires and a lot of heavy metal. In operation electric motors have power flowing through them, and the strongest electromagnetic field in, say, a power drill is in its motor. Does the electric field around the motor mean the motor has any wisdom? Nope. Radio or TV stations: They have a tall tower, and a little building next to the tower. The primary electric field is emanating from the tall tower but the radio station could be transmitting static just as easily as it can beautiful music. Does the electric field emanating from the antenna mean the antenna has any wisdom? Nope. Biomechanically the heart is an electrical pump: It takes electro-chemical power and converts it into a pumping motion to move blood around the body and keep us alive. Anatomically the heart looks like a pump with massive muscles etc. In the video they discount that interpretation of the heart and say that because it has a strong electromagnetic field the heart has wisdom etc. I think this claim is flawed and misinterprets the model being looked at. An electric motor does two things: a) primary purpose: convert electricity into mechanical energy; b) side effect is transmission of an electromagnetic field because that's what happens when you send electricity through a wire. The motor, nor the radio tower nor the pump have wisdom to make decisions. They are tools used to control power. What sends the instructions for the control of that power? Just sending power into one of those gizmos doesn't mean they'll do anything useful, doesn't mean they won't cause destruction. What's important is the quality of the instructions sent into the motor or the radio tower or the pump. It's the person pressing the trigger on a power drill that determines whether the drill is used to destroy, or used to construct beauty. The wisdom to use power constructively will make all the difference to our world. There's a radioactive plume coming from the failed nuclear reactors in Japan. Some alarm is rising over the effect of the radiation. In part the alarm is due to the decades of fearism about all things nuclear, and partly due to the real danger. It would seem in this case the real danger is much less than the panic some have been feeling. In any case there is some useful information available about surviving some of the effects of radiation releases. For example there's been a run on "emergency potassium iodide" supplies, but here in the U.S. radioactive iodine is not a danger. As Dr. James Blumenthal, DC explains in the first video below, the danger zone is within a few miles of the reactor. By the time the radioactive plume reaches the U.S. the radioactive iodine will have dissipated. One reason is the short half-life of radioactive iodine and the other is simple physics, that the plume will be spread out by the wind. There are other radioactive isotopes in the plume, and those have much longer term effects. Do not take emergency potassium iodide unless instructed to do so because it is only to be taken if there is a nuclear event within miles - not thousands of miles - from you! However, there are many natural remedies you can take and foods you can eat that will help your body deal with low-level radiation exposure, should it occur. In this video Dr. James Blumenthal, DC shares some of the most important information you need to know regarding low-level radiation and what to do about it, should it come to America from Japan. Uranium, plutonium and cesium have half-lives of about 30 years, so we need to be somewhat concerned about this form of radiation. For the other three radioactive elements, we can take glutathione supplementation and SOD. The kidneys are at risk from radioactive isotopes, and one way to help them is to take baking soda between meals, a couple times a day. Naturopathic Doctor Jennifer Fisher gives an overview of how best to protect and nourish the thyroid gland, which is susceptible to radioactive iodine. High does emergency potassium iodide tablets should never be taken unless a nuclear event occurs within miles of someone because such extremely high doses of potassium iodide will cause health problems. Dr. Fisher addresses this topic, and gives an overview of what the thyroid gland is, what it does, ways we can nourish it, and if we want to take supplemental iodine, how to do so. The thyroid "soaks up" iodine and iodide like a sponge; unfortunately, it will do so with radioactive iodine as well. Never take emergency potassium iodide unless instructed to do so. If you have any concerns about your thyroid health, or any other health issues, consider a visit to a Naturopathic Doctor.